This entry was posted on January 26, 2019 at 6:58 AM and is filed under the bad. You can follow any responses to this entry through the RSS 2.0 feed. You can leave a response, or trackback from your own site. Like the poster, what period is the film set in? The Battle of Saragarhi was fought before the Tirah Campaign on 12 September 1897 between Sikh soldiers of the British Indian Army and Pashtun Orakzai tribesmen. It occurred in the North-West Frontier Province (now Khyber Pakhtunkhwa, Pakistan). I like period settings except that given the details of the battle I’m skeptical of the politics of this film. It might well be another ‘us’ versus ‘them’ (invaders) structure. It’s Kjo production too – probably have a huge song and dance routine before going to war and the victory lap will probably last half an hour. ha.. true. Surprised Johar is producing this. Doesn’t look like a Dharma kind of subject. I know they’ve diversified and have done all kinds of things but this is a bit of a departure. sounds a bit like 300.
https://twitter.com/karanjohar/status/1039825287905566720I hope not. If there is one person who has been true in the pro nationalistic debate, he is Akshay. Ohhh come on. This was quite irrelevant. Akshay is a pro right to the centre. It doesn’t make him wrong. I replied to him in the same thread as well. We were good after that. Akshay wasn’t always right of center. Actually I still don’t think he is but it’s a bit of a cynical move on his part given that these sorts of ‘nationalistic’ films have become his forte. But when it’s about politics I don’t find cynicism forgivable. on a related note I offer as a contrast Aamir’s career. The films he’s done that can in any sense be connected to nationalism or at least a feel-good sense of the same are not in any way right of center. In other words this doesn’t automatically follow. One has only to look at MP or RDB or Dangal. Even Lagaan for that matter. TOH too will be in this sequence inasmuch as it deals with some of these things. Now of course if one ‘is’ right of center that’s a different matter. But I don’t believe Akshay is which is why I’m even saying this. I think he could be doing some of these subjects differently and avoiding this charge. In any case Aamir offers an instructive contrast. Isn’t Aamir more of left of centre? Again there is nothing wrong in being left,right,or at the centre. There are many good people in all these cross sections and one needs all the three. I’m actually never interested in ‘good’ people. Only in ‘good’ politics! Or from a different perspective ‘good’ people can do lots of ‘bad’ things if they think they’re doing it in the name of a ‘good’ politics or religion or what have you. I will have a problem with Akshay if he tries to stretch the boundaries of “Live and let live”, any religion, any caste/creed, and any extreme jingoisms. None of his films have portrayed him doing so. Wondering what’s the politics here? Am I missing anything? I’m not saying he’s Sunny Deol (in some of his films)! And it’s not always about what’s explicitly said but also what is implicit in a film. If you make a film in which Muslims are usually villains/invaders et al you confirm one kind of political narrative (one which is in fact dominant these days). If you make one where the British occupy the same role its a different deal. And Qalandar’s point is important because the Sikhs at this point in time are in a British-run army, fulfilling the strategic objectives of the British. They’re not repelling ‘invaders’ or whatever for nationalistic reasons! Before one Akshay Kumar superhit leaves the theatres, another one is beginning with its promotions. 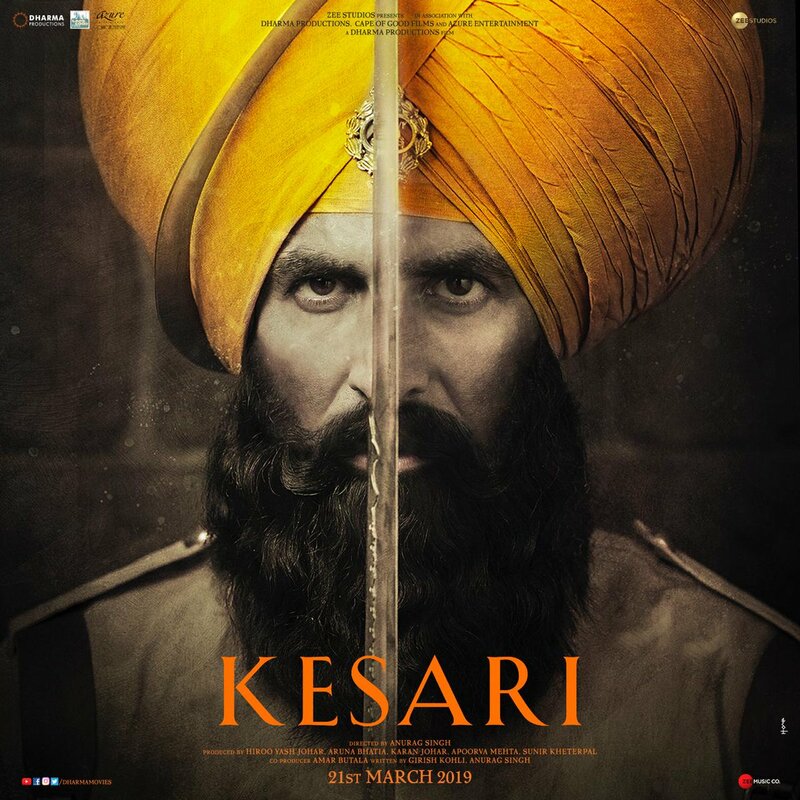 As Gold ends its box office run with over Rs 100 crore in the bank, the first poster for Akshay Kumar’s Kesari, based on the Battle of Saragarhi, was revealed on Wednesday. 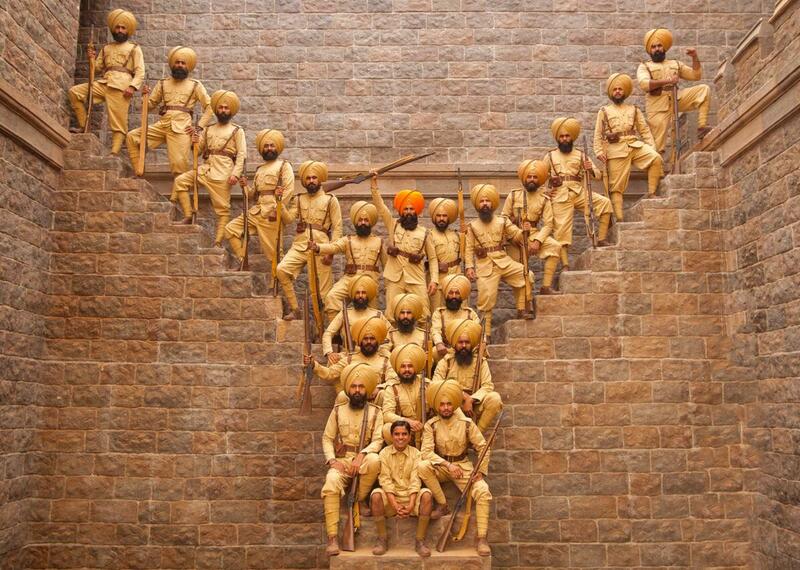 The actor shared the poster on the anniversary of the Saragarhi battle, which took place on September 12, 1897. Wow Gold is now a superhit, it was just a hit with Bollywoodhungama. Soon it will be ATB … thats called Naveen’s ‘trending’. Devil is always in the detail. However keep quoting me. striking pics …..2 thumbs up…. This sounds ideal. However in real world just like people can chose different religion, have different tastes for cinemas, have different favourites…same way there cannot be one form of good politics. There are several good politics in every ism – execpt terrorism. Expanding onAkshay and his pro right leaning. He might not exactly fit the pro right definition but he did show some leaning. On his movies’ choice of chosing one particular religion as villains/terrorists…well then it was Special 26 and Baby primarily. In those stories, it was needed as the movie was based on true stories. Most of his other movies are as democratic as any other star’s movies. I will then ask – Why has he not done a movie on nationalism? But i will not, because he did one – Sarfarosh. There the villain was shown to be from the same religions as was the villain in Baby or Special 26. Again, i am fine will all depictions. There are villains from all religion / caste and creed and has been shown time and again. I don’t think there is anything wrong in it. However we need to be stop touchy when it comes to Muslims. I think it makes most nationalist look wrong. Nationalism is never wrong. It has several merits. One can take example of its extreme which like any extreme of any ism will not be right example. How is it nationalism to celebrate British Raj conflicts against local people who are defending their land? There is nothing nationalistic in it at all, unless one puts oneself on the side of the Raj (which I am not really comfortable doing). It is not about villains being Muslim, it is that this can ONLY be considered nationalistic because it’s us vs. a Muslim other, otherwise no one would consider the Raj “us”. Would anyone consider a movie made showing the bravery of British troops who were Indian crushing the 1857 rebellion as nationalistic? Of course not. Why is this different? The answer is obvious. Our middle classes have gotten so used to “aligning themselves” with the global imperial order (then UK, now US), that we are now considering this a perfectly normal thing. It isn’t, and there is nothing patriotic about it — it actually shows a colonised mindset more than anything else. excellent comment. And here again the Aamir example is useful. You don’t have to construct a nationalism with ‘internal’ enemies. Even in a very popular context, take something like Kranti: no one would ever consider Manoj Kumar a leftie, but that is not the point — the point is he knew the stakes! He wouldn’t make a film showing Indian bravery in the service of the empire, he’d find a different “vehicle” to showcase it! Why? You should absolutely. Enemies can be internal and should be opposed. Here’s how I’d put it : internal enemies do not exist! Anywhere! It is only a certain politics that ‘creates’ them and then goes to war with them. Internal enemies does exist. The politics that creates it is wrong. Absolutely wrong. But the created is also wrong esp if it attacks your/his/her own country. Because only those at the fringe gets created by such politics. They are very few. They would have turned over anyways with even lesser provication. Still it is wrong. the ‘internal enemy’ is never just a fringe group or an extremist outfit or those who become part of these things. The ‘internal enemy’ is always minimally defined as the entire community (ethnic, religious, whatever). This is precisely how the state goes to war against itself. When there was an insurgency in Punjab in the 80s the overwhelming majority of Sikhs weren’t part of it. But the state was treating every Sikh with a degree of suspicion and using repressive measures and so on. This is ‘creating’ the ‘internal enemy’. Of course it’s a self-fulfilling cycle in certain ways. true, but notice how the state often attacks itself first. If you go after your own citizens using whatever pretext you have attacked yourself before anyone or anything has responded. This doesn’t mean the responses are ‘innocent’. I can never find such acts of violence justifiable, irrespective of ‘who/what’ started it. Nonetheless it’s important to keep in mind that the state often begins with self-inflicted wounds. If two Sikh bodyguards are part of a conspiracy to assassinate the PM and you make it open season on Sikhs in Delhi (incidentally much as with Gujarat in ’02 I am not still looking for ‘evidence’!) you are going to ensure certain kinds of consequences. ‘The Sikhs’ didn’t create this problem. Only the two (or whoever else otherwise) were part of this plot. But the state made all Sikhs ‘internal enemies’. Yes. State has the power. It is not always possible to use it correctly all the time esp under demanding conditions. But State runs by politics too. Here they go wrong by creating internal enemies. No doubt then they are absolutely wrong. In fact worse than internal enemies. A nationalistic movie has to show actions against both. However it need not be in the same movie. Or if in the same movie, both sides are not shown, it might not mean it is taking sides. Showing both the sides sometimes weakens the plot or characters and can be preachy as was the climax of Sarfarosh. Akshay’s Gabbar was the movie against the state. It was against corruption and crony capitalism. 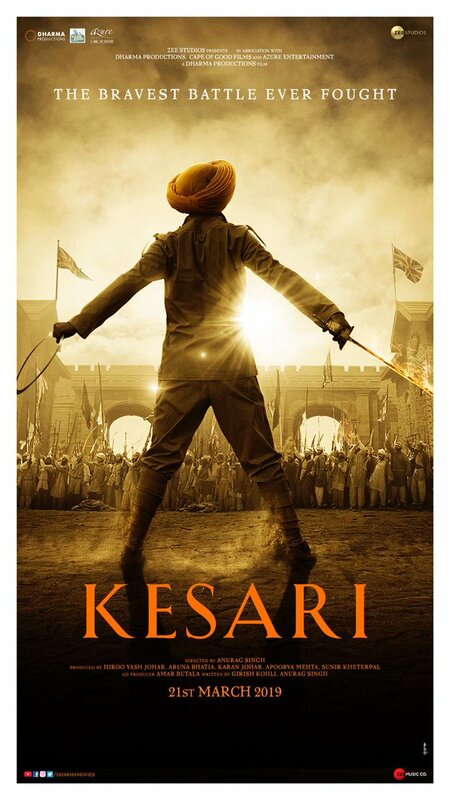 Q, Nationalistic movies was not with reference to Kesari. In fact Kesari is not at all in that bracket. It is about the bravery of sikhs. That’s it. It has nothing to do with nation, religion, colonialism, etc. At least not from the posters. There is not event a hint of it. Rest we will know once the movie releases. I am also not comfortable with aligning of anything with colonial raaj. 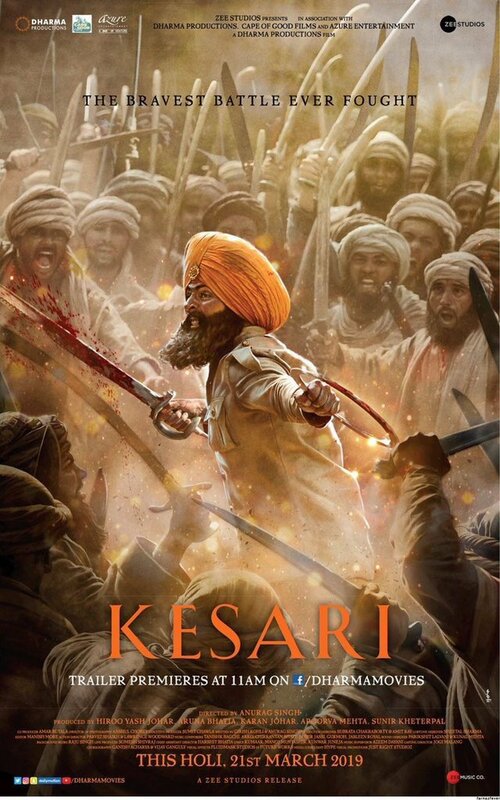 I think Kesari is more in the lines of 300 or the first 10 minutes of Magadheera. There is no Us Vs them here. Its all about us of a particular community. I agree with your assessment of our middle class being under influence of the imperial order. However this is because of the West’s open culture which has invited many from different parts of the world to immigrate there. Now China is more powerful than any other country. But they don’t have any cultural impact because they are somewhat discreet. So here will give it to west for making themselves popular. But Baby was based on True stories. Sarfarosh was not. Again if we want to see politics in everything – movie, dialogs, narration then it open a can of worms to debate. Then one has to take a stand which should not happen. ‘True’ stories can also be interpreted any number of ways. There is in any case always the ‘fictional’ in historical accounts as well. We don’t take the movie Gandhi to be a representation of things as they ‘really’ were. It is simply an interpretation of certain events. Many people like Ajay devgan,tv actor mohit raina wante to do this film.I think its the subject of small group of people winning over 10000 people that makes this subject interesting.And this makes a commercial film.Its the commercial aspect that sis responsible for many wanting to do this film than nationalism.The khan age is over Maybe you are disappointed at this.I don’t think Akshay cares about the sikhs anyway. That’s an inflammatory comment: I don’t give a darn about “the khan age” because I don’t think there IS such a thing as “the Khans”. Nothing links Aamir, Salman and SRK except the khan last name — they aren’t similar sorts of stars, don’t do similar movies, etc. Only a communal lens (sometimes this is reflexive, and not ill-intentioned, but is still communal) leads one to think of them as a group. Aside: to be fair to Akshay I think he has long had a sincere interest in Sikh causes, it is evident in a number of things he has said over the years. I’m stunned you would say that and don’t think you’ve been following him that closely. Its good that you realized that there is no such thing as khan age.People on this forum have been saying from years that how khans are ruling bollywood and so on.An all kinds of negative things are said about Akshay.not about the political aspects recently but as to how he lacks prestige and he is not an actor in anyway and so on.And good that you have a soft corner towarda Akshay. I don’t endorse this film, but the pashtuns are also invaders trying to occupy the land which is now in pakistan.So the film might not be seen as supporting british colonialism although the people fought for the british.Here the other as you call it is not fighting for their land.But it might make for a commercial film. As a historical matter the British Indian army from the 1870s onward expanded into the areas that had historically always been Pashtun areas (these areas have tended to rebel and resist all attempts at imperial control, and were considered “restive” by the Mughals (traditional hatred between the Mughals and Pashtuns/Afghans is well known; remember Sher Shah Suri was also a Pathan), the British, and even the Pakistani state. With respect to the Brits, the Pashtuns weren’t invading anyone, their indo-afghan borderlands were the ones getting invaded (Afghanistan itself was twice by the British). Or you can make a movie companion movies like ; Flags of Our Fathers and Letters from Iwo Jima. I think “Other” part in debate is relative in terms of enemity/otherness; I think many are not going to have problem if there is world war2 bravery movie where “other” is Hitler-Germany-Italy; I think in Kesari the others are tribemen. In Jodha Akbar Ashtosh ends movie before Rana Pratap encounters or Chittor massacre because the other in that case is not enemy in perception. Other in Haider was Indian Army! Sarfarosh was more balanced where you tried showing why other acted in that way (Naseer character). For matter even Roja did some balancing act. Haider did 50 crore in 2014. It is not a main stream like Dabangg or 3 Idiots but it was good medium size movie. I don’t have issue with movie depiction of main story. Because things (atrocities and excess) like that happen in tough situation like Kashmir where humans are involved. I had problem with depiction of other which I think was not fair and in end hypocritically thank Army for help in Kashmir flood. ps – Of course I have defense forces bias ; having grown up in that environment. yes but some of us commented on Sarfarosh a few days ago in exactly this context. Nonetheless when you listen to Aamir’s final exchange with Naseer in that film there is a different message. Even otherwise the film is very much a kind of procedural. The Aamir character and his team going after the terrorists or whatever in a very business-like sort of way. They’re not saying nationalistic lines at every stage of the investigation! In any case Sarfarosh is older than all the other films I’ve just mentioned. Satyam, I still don’t understand what’s wrong if there are nationalistic lines? And why do you have a measure of nationalistic dialogs, implicit, explicit, etc? Again any example of extreme of any ‘ism’ (except terrorism) will not be right examples to argue these things. Why Aamir has not done a fabulous film like Baby? If he has not done it for political reasons, then i will say Aamir is wrong in this. It shows his left leanings. As I just said I’m not against nationalism, just the right of center variety. This is precisely why I offered many Aamir films as an alternative. There is a version of nationalism in which the country is always on a glide path to greatness before something happens to spoil this trajectory. Usually the enemy is an internal one [Jews (Germany), Muslims (India), Hispanics (America), Kurds (Turkey), immigrants (Europe), all religious minorities (Pakistan) etc]. And then quite often there is an ‘enabling’ majority, usually considered left-liberal that feeds the internal virus (minority). Often there’s a foreign conspiracy as well but always aided by such ‘anti-nationals’ at home. The right wing sort of nationalism then comes to the rescue. In the other breed of nationalism the nation is already great (though not perfect) because it is more inclusive (Nehru, Obama etc) and it needs to be made more and more inclusive. This doesn’t mean there can’t be excesses on this side of the equation (there always are in practical terms) but definitionally everyone can belong in the same way. Even on the Right there was quite often such a recognition in the past. Unfortunately that more sane Right has been increasingly hijacked or made irrelevant. Yes that version of nationalism is wrong. But none of the narratives of Baby or Special 26 falls in the narrative as they are based on true stories. Special 26 is a caper film, I personally would not put it in this category at all. It’s exactly the opposite. To believe in ‘good’ people irrespective of their choices (and the consequences those choices have) is the real idealization. I’m not of course saying that people are ‘bad’ in some easy sense for not being on one side of the political divide or the other. But that’s not really a question I’m interested in. Or I might be interested in it either as a private matter or if I want to give a public figure extra points (for example I admire Sachin’s humility as a kind of bonus). Differently still there are many ‘nice’ people who supported Hitler and Stalin. I’d rather have ‘less nice’ people who supported other choices! In yet other words ‘sincerity’ might be ok as a private citizen and in one’s relationships but it is quite often a toxic quality in a public figure. You have a lot of nice, sincere people running around these days who then go and blow up others the next day. They think it’s okay to do this because they’re convinced by one Islamist ideology or the other. The people who support Trump don’t have much pf a problem with his policies literally separating parents from their children at the border and then leaving hundreds or thousands without any ability to get back to their parents. I can keep multiplying these examples. It’s not enough to be ‘good’ and ‘sincere’ when your decisions influence the lives of countless others. So of course I am interested in ‘good’ people otherwise, just don’t think this is necessarily the most relevant question for a public figure. But again this is precisely for me a ‘practical’ question. On the films I’d just say this as a general matter. One can always write any number of script on a given subject, a period, an event etc. There is still a perspective that the writer or the director has. Because any such event is always open to different interpretations. Nationalism doesn’t have to be a right of center monopoly. Absolutely. But any extreme (left or right) of any ism is not really the right examples to debate these. What it comes across is disagreement to nationalism, which is very fine for me. You invoke Hitler, Trump, Islamic terrorists in your arguments which again is an extreme. One cannot take these examples and say anti against the isms. Ofcourse anyone liking them are also leaning toward extremisms. I invoked these examples only to show that ‘good’ people can believe in these things. And for me the extreme doesn’t begin only when millions are killed. I understand. However both Q and you are highlighting only pro right of nationalism when pointing to some of the politics of Akshay’s films. I have not porblem with the pro right movies. The pro left nationalist movies are also fine with me. We do have many actors and filmmakers doing this. In fact i find these movies more interesting. Baby for me is one of the best movies on terrorism in india, for its bravery to call spade a spade. Special 26, Sarfarosh etc were all fabs. Sarfarosh for the first time brought the dilemma a pro-pakistan Muslim faces in India and his struggle to do come to terms with what is right and whats wrong. But finally the movie did say naseer was wrong. Baby also said the same thing. I think Aamir’s character makes the point towards the end that this is a dilemma only for people like Naseer (his character) not for Muslims-as-such. This is an important difference. Yes, to some extent. But when a Baby or Special 26, which are based on true stories, tries to protect the country via an operation, it is not for the country of only one community. All end with the message that it is important to protect your country. [On the rest I remain as always suspicious of nationalism. Or rather I like to celebrate love for one’s place of birth or the land one grows up in with the more jingoistic uses of one’s country. To be even more precise I’d argue that one never really loves one’s ‘country’. What one loves is a slice of life that one experiences in one or different parts of the country. But this by does not mean that one loves the country as such. One of course claims this all the time. It is common language. But there is a substitution that takes place here. Someone who is born in, grows up in, and spends his or her entire life in Thirunelveli believes in the Indian nation state as much as someone who does all these things in Faridabad. The nation ‘fiction’ embraces both these inhabitants whose experiences are otherwise completely different. All nation-states are fictions that essentially assert that to belong to the nation-state is an identity that supersedes that of one’s ethnic or religious or regional particularity. The ‘one’ of the nation-state subsumes everything. But why? Some national fictions are stronger than others and this is always useful (or not) to the health of the nation-state. The fiction is premised on geographical contiguity, a sense of common memory, commonality in the present, and so on. But note how each one of these terms is loaded with ambiguity and arbitrariness. Let’s take these in turn. By a strange quirk of fate Pakistan or the region now called Pakistan is not part of India. Are for example those who now reside in Bangladesh any less ‘Indian’ than those who live in W Bengal? Originally they weren’t but by a different inflection of the nationalist fiction they now see themselves as ‘other’ to Indian Bengalis. The same goes for Pakistani Punjabis vis-a-vis Indian Punjabis. But one’s basic identity cannot overnight become different based on lines drawn across a map! These lines are then justified retrospectively with the creation of new fictions. Somehow if the British had decided not to partition India (a tragedy in my view) the very definition of India would now be geographically different. But this works the other way also. If the secession in Punjab had succeeded in the 80s, if some of the North-East had successfully realized the same, and so on.. what would have happened? A different India? But if there is one India there cannot be a debate over its geography. Or rather that geographical modification ought not to be possible. And of course one can go back through time. The definition of India keeps altering. This of course confirms the British notion (one must never forget how much our ideas of the Indian nation-state derive from those that the British originally put in place) — the whole mystical notion of Indian continuity through time. But this doesn’t really confirm the obvious but the opposite. That this ‘idea of India’ (to use Khilnani’s phrase) is a ‘virtual’ one which can be adapted to different circumstances. Whatever commonality different groups of people might have felt at different points about inhabiting this tract of land all of this can in no way be equated with the fiction of the current nation-state. The political fictions have been different at different points depending on who was ruling the land, what parts, how many rulers, etc etc. It is always actually impossible to decide where the geographical boundaries of a nation-state definitively end. You cannot for example draw me a map of India that is completely consistent. Include any area of land you like and there will be problems that emerge. How can one be so thoroughly invested in a nation-state the contours of which are always completely contingent? Or are the outcome of historical contingency and no principle larger than this? And then there is the question of common memory. But this too is always ‘invented’. The classic example here is of the German nation-state. But what became Germany was actually the most fragmented set of states even until relatively modern times. One day it was decided to stitch all of this together into a ‘German’ nation and then a mystical memory was invented for this too. So ‘memory’ depends on political choices. In Pakistan they are forever trying to prove that they have been ‘different’ from India since ancient times. An absurd exercise if there ever was one but it is one that nonetheless reveals the vacuum at the heart of every national fiction. Because a stronger fiction simply means better political choices, not that it is more well-grounded otherwise in any metaphysical sense. But creating a dominant set of political choices also means suppressing a great deal that is not consonant with these choices. Because this must never be forgotten — the nationalist fiction is only possible by suppressing very many identities, stories, histories and so forth within that nation state. It means that one has to choose from a whole treasure trove of memories to fashion what eventually becomes the hegemonic one. For example the dominant discourse of the Indian nation-state is essentially a political construct inflected in ‘Northern’ terms. A nationalist fiction then suppresses a great deal, often brutally. How? There are very many groups who never buy into the fiction because even when they are invested in the idea of the nation-state they have differing views on what constitutes such a nation-state or at least a different sense of what kind of nation-state they ought to belong to. So those waging campaigns in the North-East do not believe they are part of the Indian national fabric. They are kept in the nation-state by force and their ‘narratives’ are considered illegitimate. Because these disturb that overall national fiction that always has to maintained by force. In any case getting back to the idea of memory it is not that whether one lived in Asoka’s times or those of Indira Gandhi one somehow had some loose sense of being Indian. Not at all! What is actually the case is that since British times this has been assumed to be the case! And here one must also consider the political arrangements of an older or ancient world which had different ways of dealing with certain kinds of ‘commonality’. For example the Greek city -states where they shared a common language and culture and where they certain defined themselves collectively as being different from say the Persians. But this did not mean that they had a primitive notion of the nation-state. In fact they privileged regional differences a great deal despite the commonality. It is as if India were a confederation recognizing its strains of commonality but also the important distinctions. Similarly when we look at other political histories from kingdoms to empires and so on we must be very careful not to simply merge them with one another as the nationalist fiction does. And finally commonality in the present. But this too follows from the other two to a large extent and then beyond this it depends on creating other sorts of choices in the present. So for example a nation-state might decide that however things have gone on in the past the most important coding of the present, the one that ought to be most definitive for the nation-state is in fact one of religion or one ethnicity or the other and so forth. In the Communist dream everyone in the entire nation would overnight be re-coded into either an appropriate ‘citizen’ of the state or its ‘enemy’. And then anything could happen from one being dispossessed to being shipped off to Siberia! One shouldn’t laugh at this last bit. It’s extreme yes but this too is where the logic of nation-states often leads us. of course the Communist dream is always minimally ‘international’ but that’s another matter. Various Fascisms are not. So commonality in the present also means very little. Indoctrination begins right away and the new fiction is immediately disseminated and is usually complete within a generation. So you have the BJP altering textbooks in many states where it is in power. Giving its version of events as it were. All nation-states are like this. Does it mean then that one shouldn’t be attached to the land of one’s birth? Not at all! But I don’t also see the need to forever limit discussion of this ‘land of one’s birth’ to the fictions of the nation-state. There is very much in contemporary India that subverts this fiction. You ran across this very interesting tribe with African roots in Gujarat. There are very many such identities in India (not all as quirky!) that are not represented by the nationalist fiction. If one just equates one’s land with the latter one then is part of the project to suppress everything that doesn’t confirm it. Consciously or not. I think there is a better way. Here I think there is a positive way to recover that virtual ‘idea of India’. Why not go all the way? I would frame it this way — I am very much invested in India but for me India defines a whole set of cultural codes, practices, histories, narratives and counter-narratives, factually attested or apocryphal, a whole body of ‘opinion’ (in the best sense of the word, the Greek ‘doxa’ if you will), a whole series of signifiers that collectively offer many competing notions and experiences of ‘India’. In other words the very label ‘India’ can constantly be re-invented or re-configured. It never corresponds to the stability of a national fiction. It defines commonality yes but one that lacks the ground beneath its feet! Put differently there is no complete or total ‘attestation’ for the word ‘India’ that would be completely consistent. But that’s fine! Because this imagining of ‘India’ doesn’t suppress any identity or any ideology and nor does it force anyone to subscribe to it. I would rather Aamir do a movie like Rang De Basanti than Baby or even Sarfarosh. Not straight black and white where it’s US vs THEM. RDB to me is a great example of a patriotic movie….change yourself before you look to change the country! Sarfarosh, Baby, Special 26 are nationalistic. I enjoy both. I think everyone should. But again this is my opinion and i respect if one doesnt. I don’t mind movies like Sarfarosh, Baby, or even inferior products like Phantom….what I have a problem with is treating the other side like a bunch of retards. What I absolutely despise in every way is the nonsensical jingoism that Sunny was doing starring with Gadar which is one piece of crap movie! To me there is a huge difference between patriotism and nationalism. Donald Trump is a nationalist whereas Obama was more patriotic. At times you need to be both, one or neither. So I would naturally prefer patriotic films overall. I hear justafan on Gadar – recently watched some of it, purely as a film it was ok in parts but it’s very silly too. Even PK’s ending where everyone in Pakistan embassy is shown as waiting for that phone call is silly. But the latter message is more productive than the former. Gadar is one movie which is quite an interesting one. Its nationalistic for sure but not always at the expense of another country. But it does stretches things to make it exciting and then pulling it back before you think you are crossing the line. The movie has several layers which can make people uncomfortable but at the same time aware of those times and circumstances and the two nation theory. In fact the movie is pro congress in its approach as it justified partition in some way and at the same time its pro Jinnah as it adheres to his two nation theory. I remember watching it in single screen theatre on second day of its release. The experience was phenomenal. Before anyone comments on this further, i will like to know if they watched it in a theatre or later. Because it will make a difference in your understanding of the movie. I watched it during its second week (I went for Lagaan in its first week end). Never ever witnessed anything close to the euphoria Gadar created in the theatres or outside. One has to experience it at that time to feel it. It was like being in a full capacity stadium at a big final with the crowd roaring, clapping, cheering at Sunny’s dialogues and action. A once in a life-time experience. Lagaan was a better movie but Gadar stole Lagaan’s thunder in terms of audience reception; Lagaan Oscar nomination somewhat balanced the narrative. That’s true to some degree though I think some of this is also down to what audience you’re talking to. Gadar was very big everywhere but truly extraordinary in North India and some of the smaller centers elsewhere. And I don’t think there was a great crossover either. At least based on my experience the Lagaan audience seemed mostly indifferent to Gadar. The opposite was also probably true. And this was just about people preferring one film or the other. Already with these two films there was the sense that they occupied different worlds. Gadar part of a much more traditional or at least older paradigm whereas Lagaan announced something new. DCH a few months later was newer still (must be the single most influential film for Bollywood since its release). At any rate I at least think it wasn’t just a clash between two films but two worldviews if you will. But you’re again right in that no one expected Gadar to do all this and so it definitely delivered a huge surprise. Gadar has had much more shelf-life than Raja Hindustani but they are part of the same phenomenon. Both films that already seem dated by the time they arrive but somehow tap into something to become huge. But they’re ignored a bit by the media (beyond recognizing the obvious) because the classes they represent are more with Yashraj or Rangeela or Lagaan or whatever. On a related note and of course at a much smaller level one of the remarkable success stories in these last 20 years or more remains Vivaah. Again at that small town level. The film kept chugging along forever. But here the big cities just didn’t keep up in any comparable sense. I watched Lagaan first and the response you saw for Gadar is what we got for Lagaan. Every ball, every wicket was cheered. Gadar the week later was not at all boisterous but I would say this is down to watching the films in UK and frankly Sunny has never been a big name here. I do remember though that both soundtracks did very well – equally. I had a similar sense at my end for Lagaan. Of course I didn’t see Gadar (had no interest) in the theater but it wasn’t as easily accessible as Lagaan anyway. Did see Lagaan twice over the first weekend. I was Lagaan same day i watch Gadar. In fact it was back to back in different theatres. I was a boy then..but what a day it was. I am sure anyone who reads that i saw Gadar and Lagaan same day in theatre is going to kill me out of jealousy. Lagaan was again an extraordinary experience. Actually i had no idea about that movie. I went with zero expectation. The first thing i liked was the earthiness of the characters. Then of course the songs and as the movie progressed, i was migrated to a great piece of land in india where everyone lived together peacefully. The British India was for the first time shown in a commercial setup. I had earlier seen them only in patriotic films like Gandhi. But here it was different. I was not a student of accounting. But i understand about taxes (Lagaan) more from this movie than from any textbook. The movie has one of the greatest casting. Can’t imagine anyone else. Everything was so perfect. And to top is, it was based on cricket. The theatre was turned into a stadium in the second half. The movie is ofcourse a text book on Management, leadership and team work. Aamir had won me over on that day. His method was then obvious. For the first time i felt his last three years of no releases was worth. I of course did not know then that the movie would get the status it had now because then i never used to think those things. For me i had watched 2 Blockbusters in a theatre on the same day and i knew i had also created a history. Ha! Gadar played unabashedly to the gallery….and it worked big time….I consider it as Amisha’s best film…..sunny paji rocked the house like never before….songs were soothing….and the masala element was just too good to ignore….Lagaan stood on its own in front of this masala-monster, that itself was a huge credit….in today’s times, Gadar would have done 400+ cr without any doutbts…. It was the same for Lagaan here as well. People were clapping and cheering and even up on their feet for every wicket. But the euphoria during Gadar was at another level. I don’t know how to describe it. I watched it twice back then (week 2 and a couple of weeks later). Both times, it was the same. Never witnessed anything like this before of after. Most people I know who went for it at that time were telling the same story. I think the film was like a storm that suddenly came out of nowhere and gripped the nation for several weeks. No one expected it. Maybe Lagaan even started stronger initially. Lagaan was much more publicised and talked about pre-release. It was a wonderful movie I had been waiting for. I wasn’t even aware of Gadar until one or two days after its release but the frenzy started spreading like wild fire. People were queuing up much before sunrise to watch morning shows shows. And it was a full blown release compared to the earlier films like HAHK for e.g. that released gradually and in limited screens. When I saw it, I could hardly hear a dialogue. The crowd was going mad, cheering, repeating the dialogues of the hero, clapping and whistling. Maybe I have to go back to Shahenshah which I watched as a kid in a cinema hall full of school kids. The owner had given 2 or 3 schools a free show on last day before school holidays. Hundreds of kids were on their feet, clapping, dancing, imitating and cheering throughout. With Gadar, they were adults and whole families doing it. I can certainly understand it. That sort of mass film hadn’t done hugely well in just about forever. Those reactions are hard to replicate for any other kind of film. My theatre experience for Gadar is exactly the same. And let me tell you, the theatres had muslims, hindus, christians, etc everyone cheering. During the movie not once did it occur that later will read that it was a bit offensive towards a particular community. This was surprising. Over last several years i have found that these narratives are in tiny minority and most saw it on laptops/TVs later as they often do towards a certain class of movies. Moreover they had Lagaan to compare with. So for them a tiny appreciation for Gadar will be followed by essays on Lagaan. However those who saw in theatres will not forget Gadar. The movie was extraordinary and was a very good love story, was about family values, was about loving your country and respecting others, was about keeping those who disrespect your country at bay, it was india’s first nationalistic movie – Love your country, Love your family, Love your spouse. The movie did have a climax with no dialog but just exchange of expressions between Amrish Puri and Sunny Deol. They are such a fantastic piece of expressions that one need not have a dialog to understand those human expressions. Again i say this- if one has to find politics, then can do so in everything, every movie, every dialog. There are few movies which should cover all views, few which cannot, few which should not. I will leave it here. This is a stunning pic. The gaze and the symmetry except for the ring on the turban is striking. REMARKABLE PIC. Quite stunning how it’s symmetrical! For Akshay’s fans…rewriting history means doing better than last Akshay grosser. So in case someone felt offended, then sincere apologies. Delhi-Punjab-Haryana Opening day record is at stake here. It was 21 SIKHS fighting 10,000 INVADERS. TRAILER out on 21ST FEB! like the rest of akki films…..i will give this a miss…. This movie will rile off many people. There are many who could not watch URI as well. I can understand. Cannot post in Badla thrailer thread. don’t know why. somethimes this happens all of a sudden. So putting it here as the only star who has managed to continuously reinvent is Akshay Kumar. The visuals look good. Seems to be a movie made on a much bigger canvas than the usual Akshay Kumar film. Looking forward to it. It is in my to-watch list during the next weeks, along with Badla and maybe, Total Dhamaal.